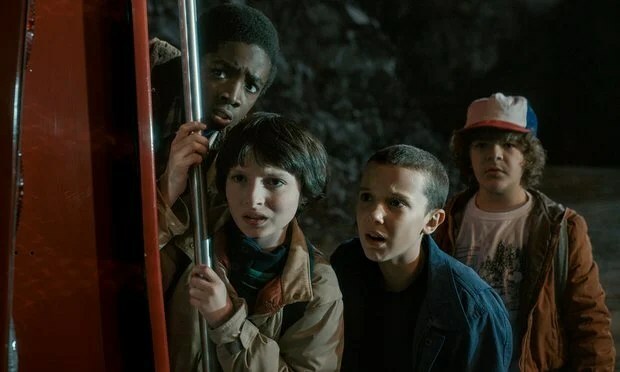 Netflix’s Stranger Things provides a welcomed dose of comforting sci-fi horror nostalgia that will transport you back to the ’80s. If you can’t get enough of Stranger Things, here is a little bit of info about the creation of the show. By now, you’ve probably binge-watched all 8-episodes of Stranger Things and waiting in anticipation for Season 2 (October 27th). It’s a great show that manages to capture everything we love about the Spielberg era. You might have noticed, but the show borrows a bit of every film you loved as a kid, including Jaws, E.T., Nightmare On Elm Street, The Goonies, and many others. It’s such a clever idea really. Below are a few facts about the creation of the series. 1. The Duffers edited a mock “trailer” and combined clips from over 25 feature films to help sell the show. Among the list, is E.T., Super 8, and Halloween. 2. The show’s composers, Michael Stein and Kyle Dixon, wrote over 13 hours of synth music for the show. Some of the other music included on the show’s soundtrack are ‘She Has Funny Cars’ by Jefferson Airplane, ‘Africa’ by Toto, ‘Should I Stay or Should I Go’ by The Clash, ‘Hazy Shade of Winter’ by The Bangles, and ‘Heroes’ by Peter Gabriel. 3. One of the coolest things about the show is the opening title sequence. If it seems familiar, it’s because it was inspired by the work of Richard Greenberg, who designed a number of classic ’80s title sequences (including Alien, Altered States, Superman, and The Goonies). 4. The look of the no-face monster was achieved through a combination of prosthetics, animatronics, performance, and CG. Many of the kids on set were very scared by the “monster”, but they were calmed when told that he was just like the monsters in Monsters, Inc. Yeah, I’m not sure that would work on me. 5. 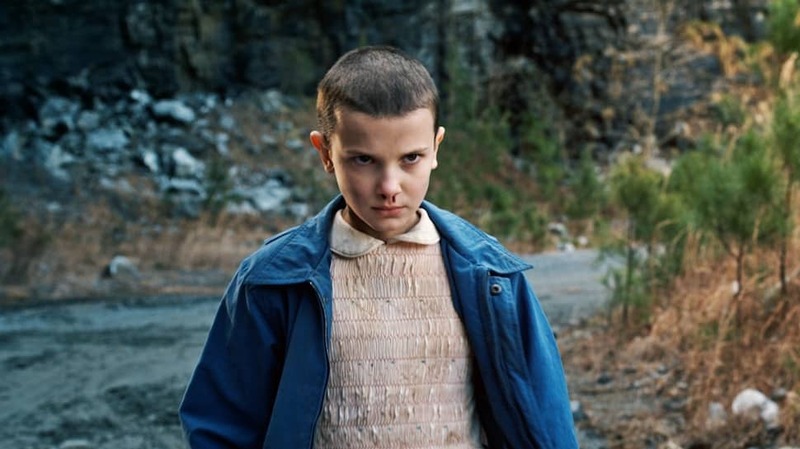 Millie Brown, the actress who plays Eleven, had to shave most of her hair off for the show. She was terrified of the idea. However, the Duffers showed her Charlize Theron’s look in Mad Max: Fury Road, which convinced her. 6. Actor Gaten Matarazzo plays Dustin Henderson, who suffers from a medical condition called cleidocranial dysostosis. It is a disorder involving the abnormal development of bones in the skull and collar (clavicle) area. 7. The Hawkins Police Department vehicles and uniforms are identical to those used in Steven Spielberg’s Jaws 1 & Jaws 2. 8. Eleven’s story shares a similar premise to Stephen King’s Firestarter about a young girl with special powers escapes from a government facility and must evade her tormentors. 9. The shed where Will disappears has an upside-down horseshoe above the door, which signifies bad luck. 10. 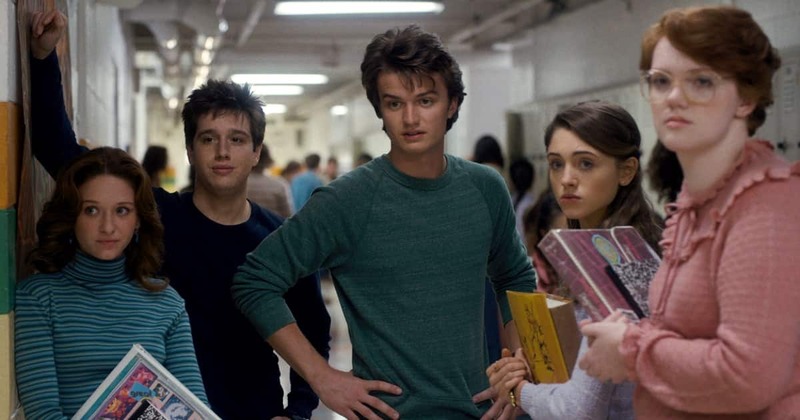 The masters of horror took to Twitter to praise the Duffer Brothers’ Netflix series. Both Stephen King and Guillermo del Toro gave the show a thumbs up.